Take your next champagne toast to a whole new level of decadence with a Raspberry Champagne Float! It’s a cocktail recipe and dessert recipe in one that’s perfect for a special occasion like Valentine’s Day or New Year’s Eve. Or just because you deserve to treat yourself! Cheers to a Sweet and Bubbly Champagne Cocktail! I grew up thinking that champagne was a rare treat only meant for the most special of events or New Year’s Eve. Growing up, I only remember champagne being enjoyed at a wedding. Then my husband and in-laws came into my life and my perspective on champagne changed. Whether champagne or sparkling wine, there are lots of occasions to celebrate, sometimes even just surviving a week of toddler tantrums, and a champagne cocktail is a great way to toast! My love of champagne should be pretty clear by my growing list of champagne cocktail recipes on this site! Each one feels special and elegant, even though most of them are very simple recipes. 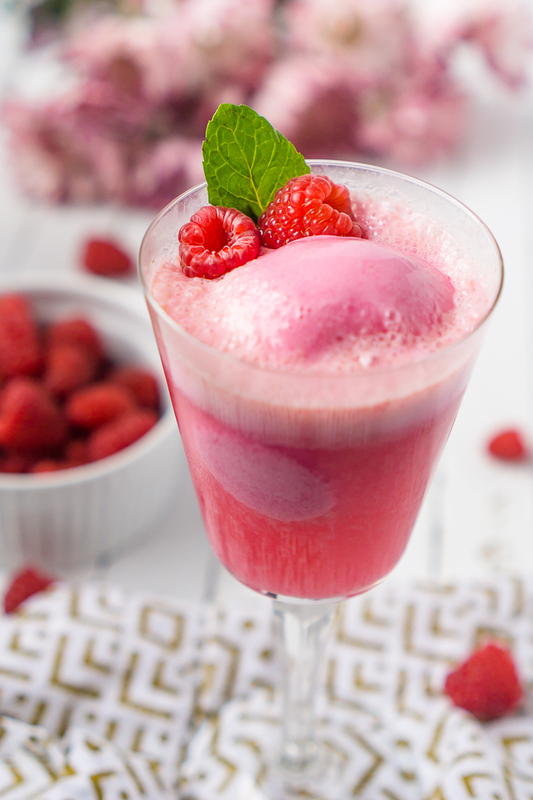 This recipe for a Raspberry Champagne Float is one of those super easy cocktail recipes! It’s a dessert and cocktail all in one! With only two necessary ingredients, you can quickly serve yourself or guests this sweet and bubbly drink. I like to enjoy the first few bites with a spoon to enjoy the fizzy float texture you’ve come to know and love, except this time you’re enjoying a very adult ice cream sundae! As the sherbet melts, put the spoon down to enjoy sipping on the rich, frothy drink. Trust me, you are going to love this! Time to Enjoy this Dessert Champagne Cocktail Recipe! 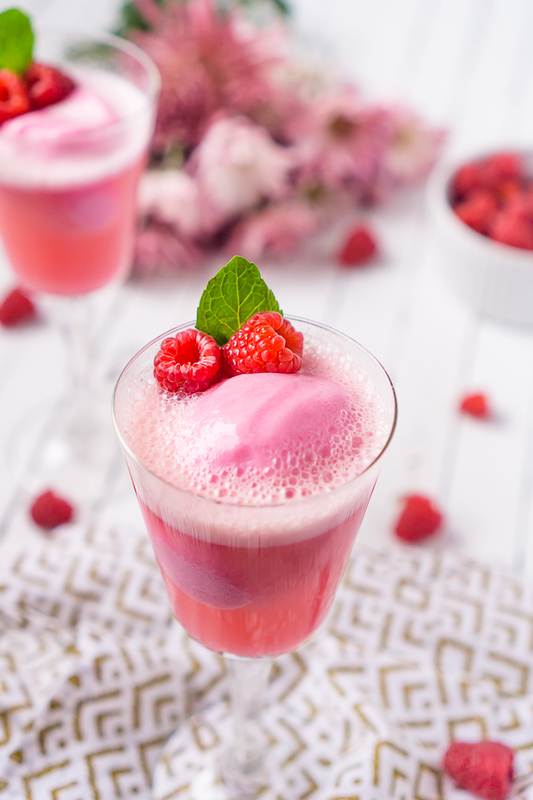 Raspberry Champagne Float Cocktail is the perfect dessert recipe and cocktail recipe in one with raspberry sherbet and sparkling wine!! Add one scoop of sherbet to each glass when you are ready to enjoy. Top off your glass with champagne or sparkling wine. 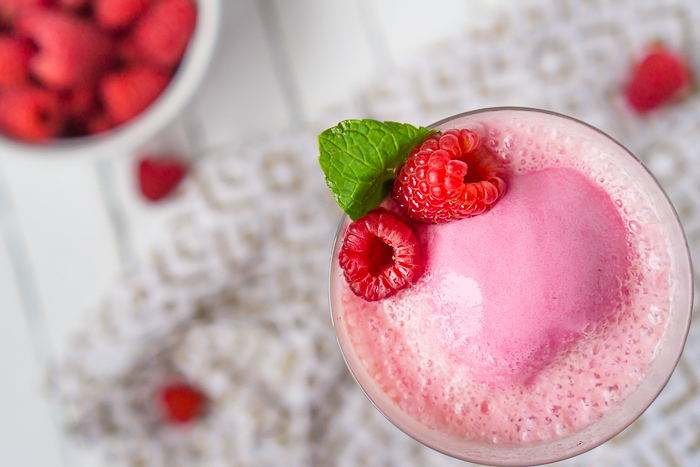 Garnish with optional fresh raspberries and mint, then enjoy! Very easy and looks so fancy! Thanks for sharing!